Campus Enterprises offers a variety of services that help departments better serve their students and employees. Talley Student Union: More than 283,000 square feet of space including meeting rooms, grand ballroom, theatre, outdoor event space, on-site printing, restaurants and bookstore. Located on Cates Avenue adjacent to Reynold Coliseum. Park Alumni Center: Located on Centennial Campus, this elegant facility has premium meeting spaces, a grand ballroom and a large outdoor patio. Ample parking is available. Lonnie Poole Golf Course: Clubhouse with meeting rooms, dining room and firepit patio overlooking Centennial Campus and downtown Raleigh. Eighteen holes of championship golf. Ideal for luncheons, golf outings and fundraisers. Ample parking. Duke Energy Hall: Located in the award winning Hunt Library this features more than 7,000 square feet of meeting and presentation space. Witherspoon Student Center: Centrally located; this multipurpose facility features a 500-seat theater, art gallery, library, study area and meeting rooms. These spaces are available for a variety of needs: meetings, workshops, fundraisers, retreats, golf outings/tournaments, galas and official university functions. We can even partner with you to bring in noted speakers. Our team can help you find the right space and identify other needs that you might have, such as a/v, catering, decor and even food-related take home gifts. We have multiple options to meet your budget as well. 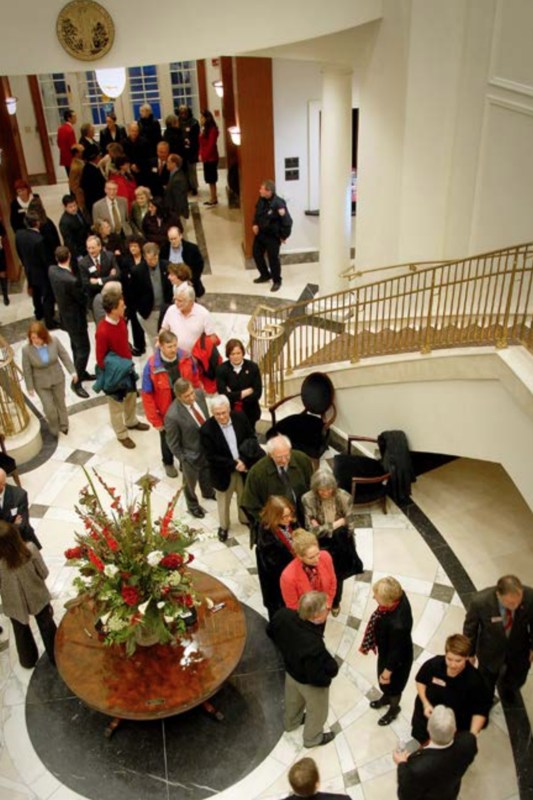 To learn more or to start planning an event, call 919.51.EVENT (919.513.8368) or visit rave.ncsu.edu. There’s no need to go off campus to entertain your campus guests or get out of the office for lunch. 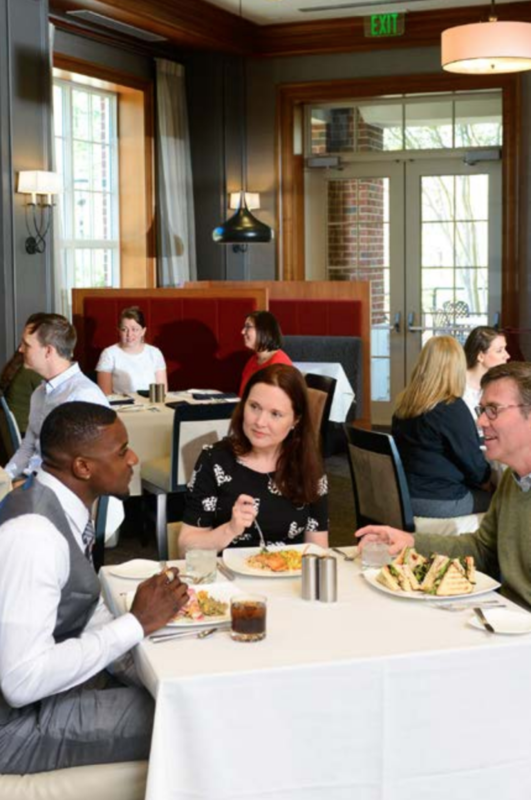 We offer three sit-down restaurants on campus that take campus P-Cards as well as an Autograph Collection Hotel on Centennial Campus. If you’re hosting visitors or want a special place to dine, we offer three options with table service that are sure to satisfy and impress. For parties of 10 or more, please call for a reservation. All NC State Dining locations accept campus P-Cards. The new StateView Hotel and Conference Center, an Autograph Collection Hotel, is located on Centennial Campus next to the Park Alumni Center. Make these accommodations your first option when hosting campus guests. Use the code NQA for tracking purposes as well as to get the best rate. Visit stateviewhotel.com for details. We also provide design and mail preparation, and our prices are competitive with off-campus printers. We also offer free on-campus delivery. Many professors use Wolf Xpress for coursepacks to be sold through Wolfpack Outfitters in Talley Student Union. Wolf Xpress is also a great resource for students’ copy and printing needs, such as scientific posters and reports. We can even print theses and have them bound in leather with gold or white hot-stamp personalization. To learn more, stop by Wolf Xpress in Talley Student Union, call 919.515.2131 or visit wolfxpress.ncsu.edu. For campus-wide events or messaging, we can help you print your banner and have it placed in the Talley lobby. We can also work with our marketing department to have your digital messages displayed in the dining facilities and student centers. 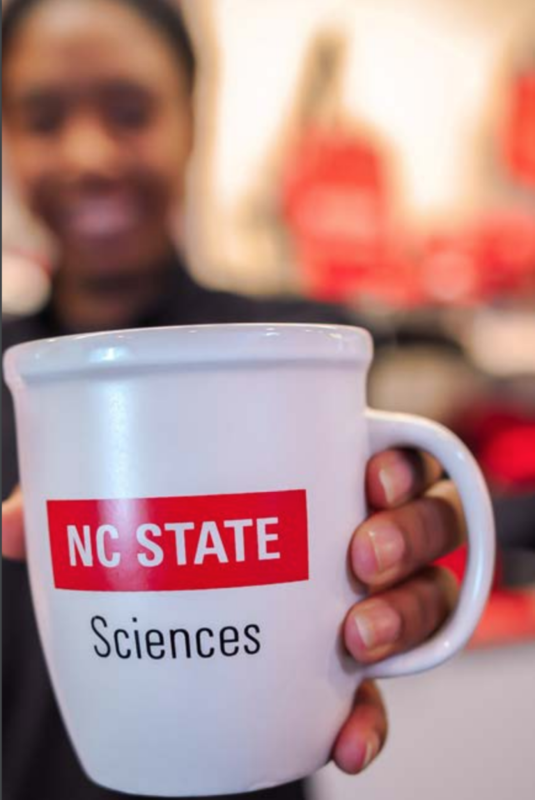 The NC State Stores features two on-campus retail options: Wolfpack Outfitters in Talley Student Union and a smaller shop in Wolf Ridge on Centennial Campus. These stores have a wide selection of presentation folders, retirement gifts, thank you notes, thumb drives, office products and other merchandise. Departmental billing is available, and eligible purchases receive a 20 percent discount off the order in addition to being sales-tax exempt. In 2016, the NC State Stores introduced State of the Art, a new store in Talley Student Union, which focuses on NC State-branded apparel and merchandise. It even has an on-demand t-shirt printing machine and custom design services. We work with University Communications and Trademark Licensing to make it easy to order branded apparel and promotional products without an extended multi-bid and approval process with competitive pricing and turnaround times. In fact, Trademark Licensing is a part of Campus Enterprises, and our director, Gregg Zarnstorff, is available to consult with you on brand guidelines and the use of licensed vendors. He can be reached at 919.515.2146. 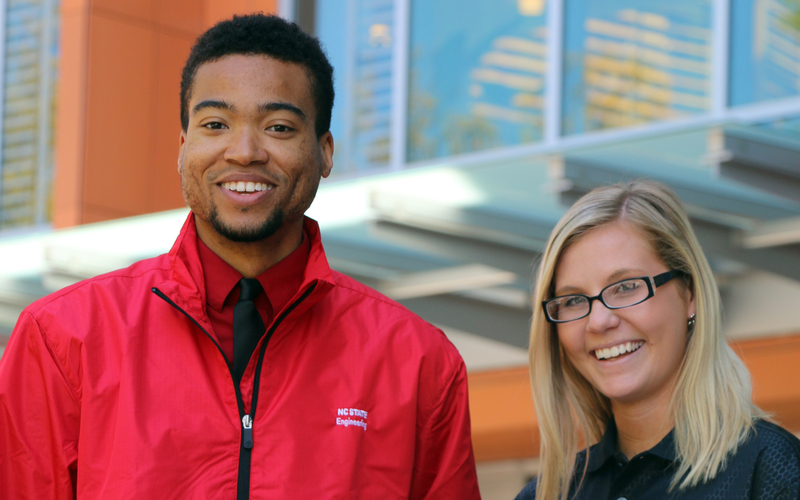 Learn more at go.ncsu.edu/state-of-the-art, call 919.513.6107 or stop by our store in Talley Student Union. Campus Enterprises offers a number of ways for our faculty and staff to save money on campus. Computer and Tech Purchases: NC State Stores offers full-time, permanent NC State employees an opportunity to purchase computers, tablets and accessories through payroll deduction. Purchases are made through an initial down payment at the time of purchase, followed by six or twelve monthly interest-free payments made through payroll deduction. Faculty employed nine to eleven months of the year will have their pay deducted during the bi-weekly or monthly periods when they receive their salary. No payments are due from them during the time that they are not on the university payroll. To learn more, visit the Technology Department in Wolfpack Outfitters at Talley Student Union, Monday – Friday between 8 a.m. and 4 p.m. or call 919.515.2161 during the same hours to apply and set up your payment plan. 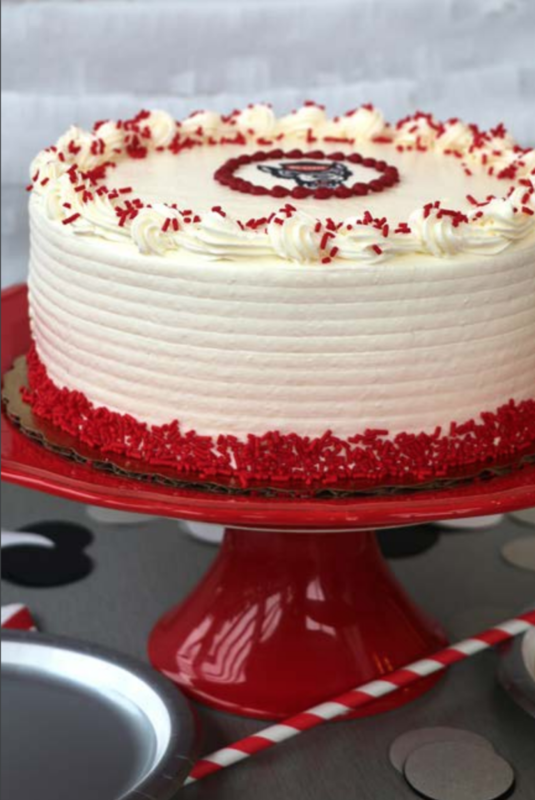 Yates Mill Bakery, located in Talley Market, has an online portal to order custom cakes and treats. This is especially handy for birthdays and holidays. Look for a variety of cakes, cookies and cheesecakes, plus holiday favorites like pumpkin and pecan pie. All treats are made on site with quality ingredients by our executive pastry chef and team. Visit go.ncsu.edu/yates-cakes. NC State Stores routinely sends emails containing product offers, event and sale notifications, coupons and more. Don’t miss out on these specials! Visit go.ncsu.edu/mailinglist to sign up. Talley offers a variety of open spaces that are available on a first-come, first-serve basis for impromptu meetings or just to get out of the office for a change of workspace. Pack up your laptop and come explore this great space available and open to the entire NC State campus community. This teaching facility offers eighteen holes of championship golf, an elegantly appointed clubhouse, full-service golf shop and indoor training facilities, restaurant and bar, plus an outdoor fire pit overlooking downtown Raleigh. Faculty and staff enjoy reduced daily rates and a package plan for frequent play. Visit go.ncsu.edu/lpgc or call 919.833.3338 for details.